GRAND OPENING APRIL 27th 12-5PM!! Come tour the facility, get snacks (provided 12-2pm), live radio from JessFM, meet a variety of vendors, and enter to WIN prizes. 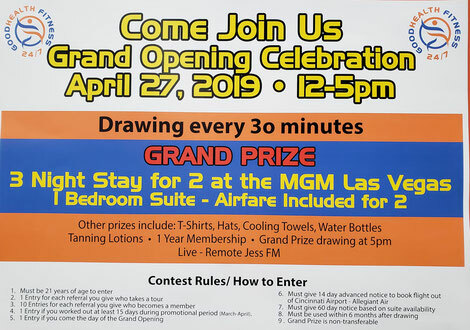 Grand Prize trip for 2 to Las Vegas!! MEMBERS AND NON MEMBERS WELCOME!! Memberships start at only $10 a month!! We have extended our $10 enrollment offer by popular demand!! Come sign-up and take advantage of this offer, or sign-up online with the join now tab. Everyone starts at a different fitness level, and we are here to help get you started on your fitness journey, no matter the level you are starting on. Members who upgrade from the Silver membership to the G.H. Express membership receive a FREE T-shirt. Class schedule will stay the same for March!! Feb. Class Schedule Has Started!! Come join and sign up for one of the classes we offer. We can help you get started with your fitness journey or help you progress with your journey to reach your goals. Everyone belongs and starts at a different level. We are here to help you. JOIN NOW ONLY $1 DOWN. FREE SYNRGY CLASSES INCLUDED WITH A MEMBERSHIP!! Synrgy 360 is a functional-style of circuit training. 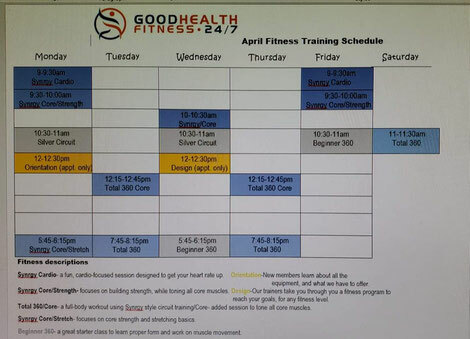 Our instructors lead you through a 30 minute class, where you rotate through a variety of stations. Get the benefit of working out in a fun group atmosphere. Receive a class schedule when you sign up, and see which class is best for you. PRE-SALE TODAY MONDAY OCT 29th! We are excited to start signing up members! Be the first member to join. You can join on the Join now tab, or contact us to join in person. The first 100 members will receive a t-shirt. Join for $1 down until Dec. 16th, this is a $69 value. Be sure to like us on Facebook and stay connected with us. We appreciate your support and membership. Feel free to contact us and ask any questions you may have. More details to come.